Laura Mercier is the brand I have always loved and trusted for the concept, ideology, and the face of timeless beauty. Laura Mercier, the pioneer of the “Flawless Face”, is a world-renowned makeup artist and creator of Laura Mercier Cosmetics, Skincare, Body & Bath, and Fragrance. Laura is the innovative force behind the brand’s iconic products, French aesthetic, and artistry techniques. She continues to teach and inspire through her philosophy; “What makes you unique makes you beautiful.” I am a fan of the Laura Mercier Translucent Powder since many years and I still have my first jar, a little is all you need for the natural finish. Another favorite from the brand is the radiance primer which I have it on my list to repurchase as I just finished one. 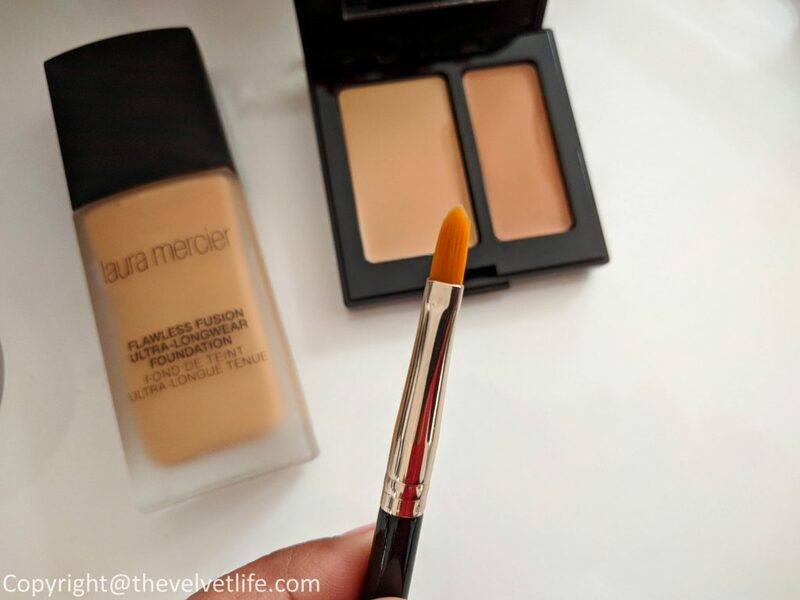 I am going to discuss two new favorites from the brand which I am wearing almost every day nowadays, Laura Mercier Flawless Fusion Ultra-Longwear Foundation and Laura Mercier Secret Camouflage with the Secret Camouflage brush. “Laura believes that Foundation’s true purpose is to even out your skin tone so it looks it’s very best. Her foundations create a flawless, natural look that lets your skin show through, yet they are distinctly lighter in weight and texture than conventional formulas. The aim is to enhance your beauty, not cover it up.” I truly believe in that, I do not mask my face with everything artificial but use it to enhance what I already have, not to become another person but to look and feel a better version of myself. Laura Mercier Flawless Fusion Ultra-Longwear Foundation (CAD $59) is described as the perfect balance of blendability, coverage, and comfort. The foundation is high-performance wear that is sweat, humidity, water, and transfer resistant for 15 hours. The coated pigments glide on to create buildable medium to full color that beautifully evens out skin tone and minimizes the look of pores and imperfections. The weightless texture looks, fits and feels like a second skin. The skin-fusion technology provides ultimate long-wear with breathable ease. Controls oil immediately and throughout the day. The matte finish is never dull, flat or cakey. The weightless texture looks, fits and feels like a second skin. Skin-fusion technology provides ultimate long wear with comfortable, breathable ease. Laura Mercier Flawless Fusion Ultra-Longwear Foundation is a medium to full coverage foundation, the finish is matte. It is suitable for all skin types, especially normal to oily. The packaging of the foundation is in a beautiful heavyweight glass bottle with a pump, the cover, and the bottle has a beautiful luxurious feel to it. The formula is lightweight and the consistency is medium, neither runny nor thick. One pump is all I need for medium coverage and two pumps on the day I need full coverage, I do apply it on my neck too, otherwise, one and a half pump is enough for full coverage. I prefer a brush to apply foundation when I need full coverage. For medium coverage, either the brush or the sponge or the beauty blender works best. As the finish is matte, I do use the Radiance Primer from Laura Mercier or any other brightening primer as I do like a natural glowy finish. 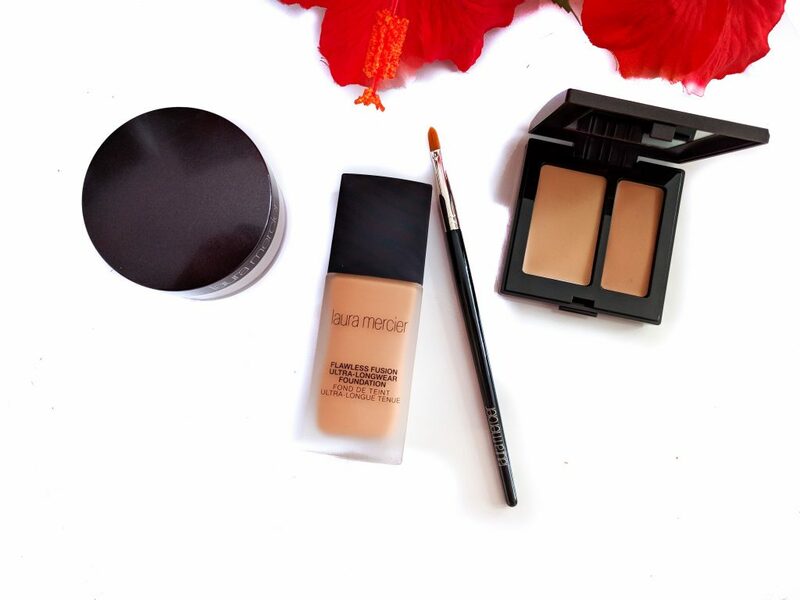 The foundation is easy to apply and blends in seamlessly with the skin, covering most of my problem areas and spots. The skin looks even, naturally flawless, and with a healthy radiance. The staying power of the foundation is really great, I had it on for over 13 hours and I am impressed with the results. I do set it with my powder puff or the powder brush, or the setting spray also does the trick after I am done with my face. I noticed no irritation, breakouts, or oxidization while using this foundation. I have combination skin and I am very careful about the foundation which tends to get patchy around my oily areas but this does not give me any issues. It goes on so smoothly and makes my skin look great. 4N1 Suntan is the perfect shade for my medium tan skin tone with golden undertones. It is not too orange, nor very neutral, the perfect balance. This foundation is available in 20 shades and range from very light to dark with various undertones. Laura Mercier Secret Camouflage (CAD $42) is described to provide a full camouflaging coverage that leaves the skin looking natural and flawless. It has more pigmentation than a traditional concealer, has long-wearing formula which covers completely to retouch flaws one by one. It gives a look of natural perfection camouflages blemishes, shadows, scars, capillaries, discolorations, redness, age spots, the nose area. The unique two-shade compact allows you to customize exactly the right shade and undertone to match your skin tone every day, any time of year. It is suitable for all skin types. 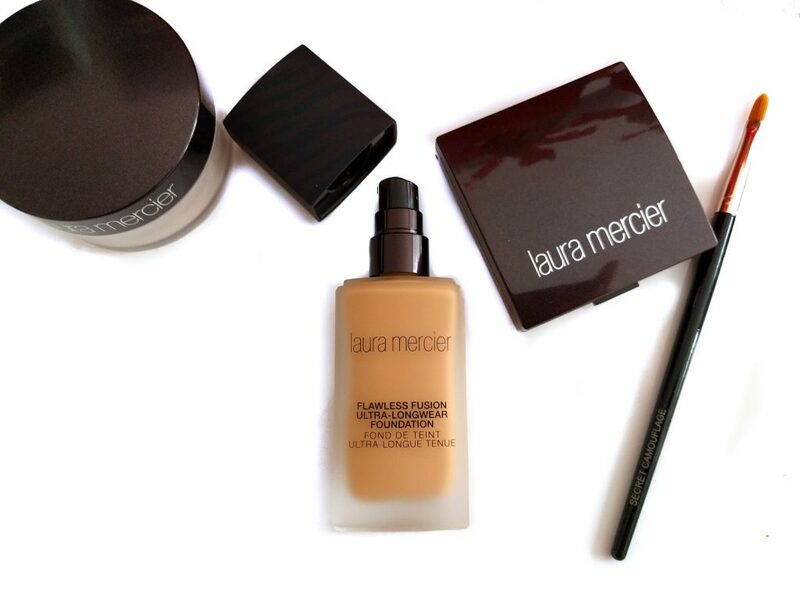 “To create the look of even, flawless skin, Laura turns to concealers, with specialized formulas for eyes and face. Either way, apply sparingly and build as needed, where needed. 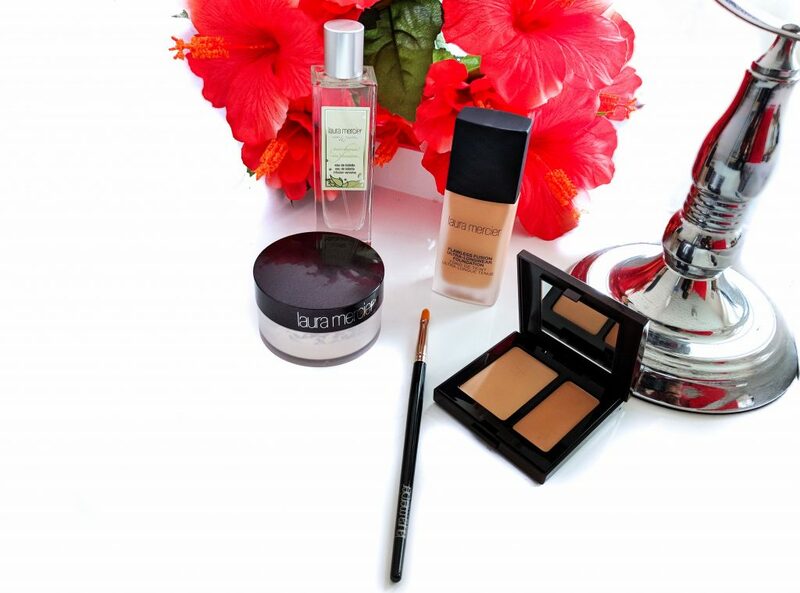 Especially under your eyes, you want to subtly brighten, but the tone should blend seamlessly with the rest of your look. I have acne scars and pigmentation which I deal with many times in a year due to the hormones and external factors. A good concealer is always a game changer and mood enhancer I believe. This secret camouflage is like a secret weapon indeed, no doubt why it is so much loved all around by the makeup artists or beauty lovers. I really like the idea of having the two shades to mix and match based on the undertones and the concern where it has to be used, such flexible product it is. It provides full coverage, the formula is very creamy and blends really well into the skin. I have used it many times to spot conceal and also for the pigmentation, the finish is very natural. The staying power is pretty good, without touch-ups it stays on well for the whole day around 8-10 hours which I tested for. 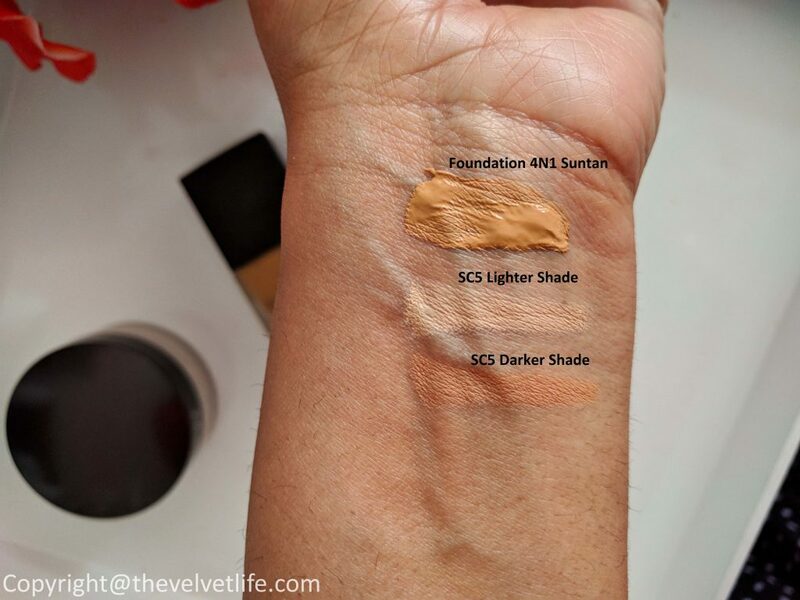 SC5 works very well with my medium tan skin tone. It is specifically meant to be used on the face to camouflages blemishes, shadows, scars, capillaries, discolorations, redness and age spots. With the Secret Camouflage Brush, I custom blend the two colors by mixing the two shades on the back of my hand until I find the blend that matches my skin tone. Then I use feather-light strokes to apply to areas of the face that need covering, concealing, or camouflaging. After applying with the brush, I pat in gently with fingertips. Secret Camouflage is not recommended for under and around the eye area because it is not emollient enough as I had few questions if this works well under the eye. Laura Mercier Secret Camouflage Brush (CAD $34) is a perfectly shaped for precise application in the tiniest areas including shadows, corners of eyes, tiny scars or blemishes. The flatter, wider surface at the base of the brush is ideal for larger areas like ruddy cheeks, patches of broken capillaries, sun spots or any areas of discoloration. It picks up the right amount of product and works great to keep concealer from being too thick and cakey. Also, it does help in applying the product in the small areas as well as the tricky areas to cover the problem. The synthetic bristles are soft yet firm enough to fill in lines and give flawless coverage over spots. I have experienced no shedding and is highly precise. As a long time user and fan of this brand, I am very satisfied with these three products that I have been using these days and would recommend you to check them out. 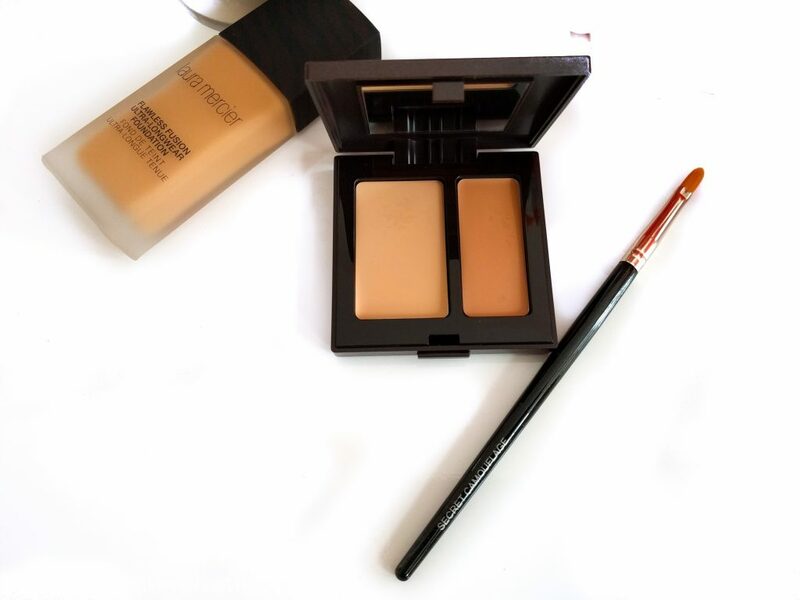 Laura Mercier Flawless Fusion Ultra-Longwear Foundation, Laura Mercier Secret Camouflage, Laura Mercier Secret Camouflage Brush are available at Sephora Canada, Sephora, Holt Renfrew, Saks Fifth Avenue, Nordstrom, SpaceNK, and Net-A-Porter.